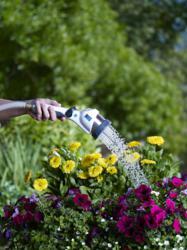 Pure Rain oxygen-infusing garden products provide chemical-free way to increase plant growth by up to 30 percent. "Mother nature grows big, tall forests without any added chemicals or fertilizers." When people think of water pollution, they often imagine large oil spills or waste from industrial plants as the primary culprits. But according to the U. S. Environmental Protection Agency, nonpoint source pollution--or pollution from smaller, scattered sources, including residential lawn and garden chemicals--is the leading source of water quality problems. “Some of the chemicals put on landscapes gets taken up by the plants, but a lot of it washes off into the lakes, rivers, oceans, and streams and eventually winds up in the ground water,” says Paul Tukey, author of The Organic Lawn Care Manual. Rain collects oxygen as it falls from the sky, delivering maximum oxygen to plant roots naturally. By the time water comes out of a hose, much of the oxygen has dissipated. But new technology makes adding dissolved oxygen to soil easy and economical. “Pure Rain™ nozzles and sprinklers infuse ordinary tap water with oxygen contained in nano-bubbles, each about one tenth the diameter of a human hair,” explains Scott Schellhase, executive vice president of Bluemark™, the maker of Pure Rain™ lawn and garden watering tools. “This process mimics the benefits of natural rainfall by maximizing the oxygen saturation in water over a wide range of temperatures,” he adds. An effective and practical delivery system of oxygenated water to plants’ root systems is crucial for their growth and vitality. “The more oxygen available to a plant’s roots, the more efficient its respiration, the process plants use to generate energy and growth,” says Schellhase. The oxygen provided by Pure Rain™ also helps prevent overwatering plants, which can lead to their suffocation. In independent studies conducted by Bureau Veritas, plants watered with Pure Rain™ products developed more robust root systems, absorbed more nutrients, and grew more leaves than did plants watered with ordinary tap water. Ultimately, plants grew up to 30 percent larger without the use of potentially harmful chemicals or other soil amendments that often end up back in the water supply. Pure Rain™ spray nozzles, spray wands, and watering stations bring nanobubble technology—already in use for industrial, commercial, and institutional projects—to the individual homeowner. The variety of Pure Rain™ product designs, water capacities, and configuration capabilities enables homeowners to find the product or combination of products that works best for their garden or lawn watering needs. Three Pure Rain™ products have received 2011 Good Design™ Awards for design excellence. All are ergonomically designed and easy to use, and their construction is backed by a five-year warranty. Pure Rain™ products are currently available in the U.S. at Target and Lowe’s and in Canada at Canadian Tire, The Home Depot, Lowe’s, and Walmart. More information about Pure Rain™ products is available at http://www.purerain.com. Water – it’s the necessity of life and our most precious resource. Unfortunately, freshwater shortages around the world are having a profound impact on fish and aquatic plant life, farmland, fisheries and food availability. As the global demand for water continues to increase due to population growth and industrialization, scientists and world leaders are racing to develop strategies and technology to combat this global crisis. It is this need that has driven blueMARK™ to develop revolutionary, patented consumer products that address the current and future global water challenges in an efficient and environmentally sustainable way. By incorporating the basic principles of biology, blueMARK™ has developed patented products that use micro nanobubbles to oxygenate water in order to maximize its efficiency and conserve its supply.